United Food Operation works out of new distribution center | United Food Operation, Inc. The United Food Operation, Inc. 2016 food distribution season has officially begun. This morning at 8:00 A.M., volunteers from the Nitro Food Pantry joined UFO volunteer staff at the program’s new facility to sort food destined for area food pantries. The new United Food Operation headquarters and food distribution center at the Institute Industrial Park. Dow Chemical Company, the building’s owner, has donated use of the building to United Food Operation. The new UFO headquarters is located in Institute, across Route 25 from the Institute Post Office. This is the program’s 34th consecutive year supporting area food pantries. 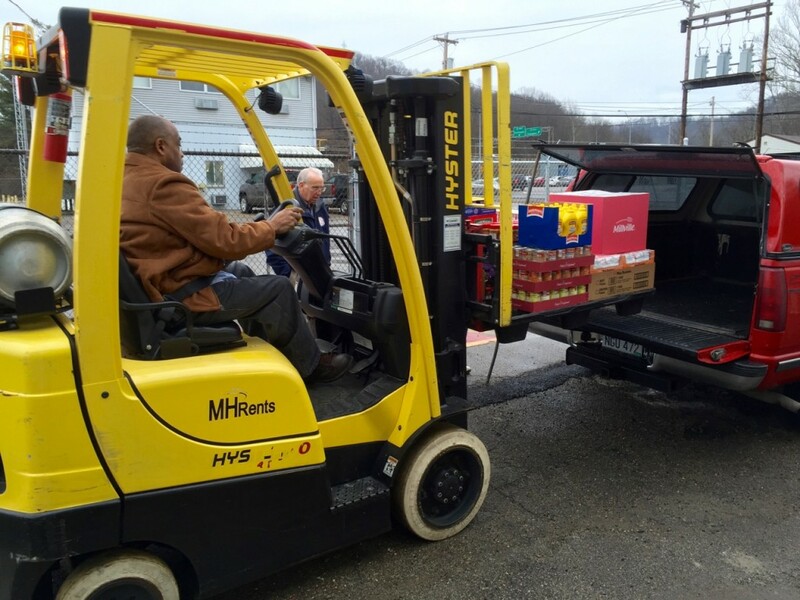 Each Saturday morning this winter, food is loaded into trucks from area food pantries. Early Saturday morning, pantry trucks will arrive and be loaded with pallets of food. UFO provides the food free of charge to 12 independent food pantries around Kanawha and Putnam counties for a 12 week period, from the winter through early spring. The new facility was made possible by generous donations from two Kanawha Valley industry stalwarts: Dow Chemical and Bayer CropScience. As part of an agreement between the two companies, Bayer completely cleaned and renovated the building for UFO’s use before passing ownership to Dow, which then donated the use of the building through a lease to UFO. Dow is also covering the cost of utilities. 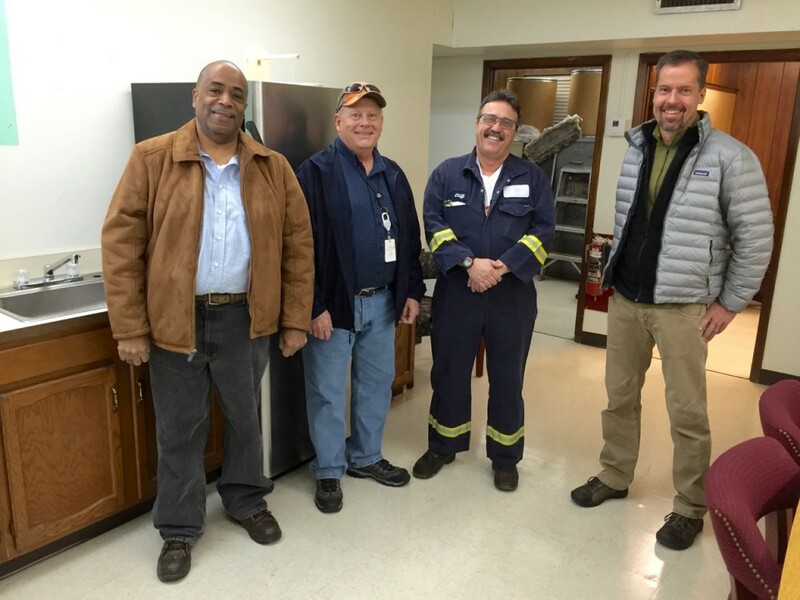 Part of the United Food Operation brain trust gathers to check out the break room at UFO’s new headquarters. L to R are Joe Davenport, from Dow; Darryl Boggess and Clifford Means, both of Bayer CropScience; and Andy Altman, Dow Chemical. Donations from the two companies have been vital to UFO’s continued operation. 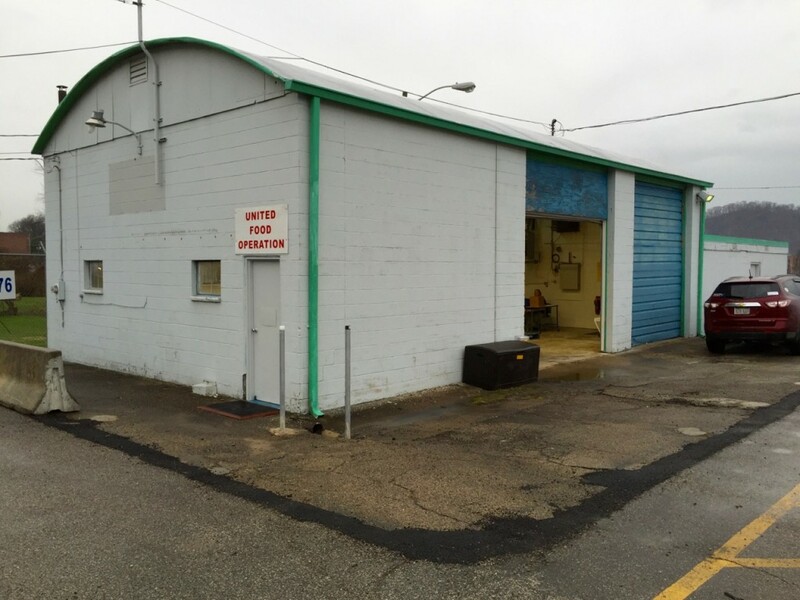 For the first time in its long history United Food Operation will have a year-round home with office space and a furnished conference/break room. The break room has a small kitchen area and large table that will double as a conference table for meetings. 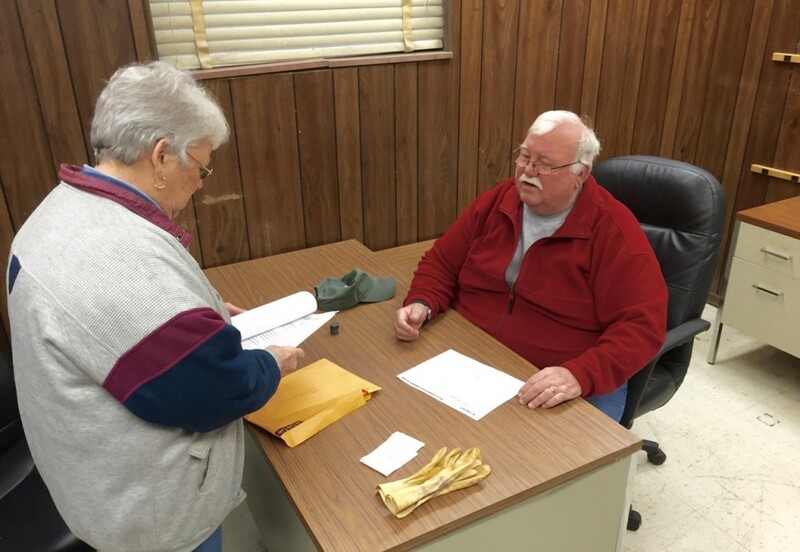 UFO Treasurer Kay Moffat and volunteer Joe Gresham break in the new office space. Gresham oversees food purchases and food distribution operations for UFO. Behind the break/conference room, in the back section of the building, is UFO’s office space. Also at the rear of the building is a bathroom and a storage room. The building is fully heated and air conditioned. That’s not always been the case for UFO in the many donated spaces it has used through its 34 years. Joe Davenport operates the forklift at the UFO distribution center. Use of this forklift was donated by MH Equipment. United Food Operation is very thankful for the support it receives from area businesses. 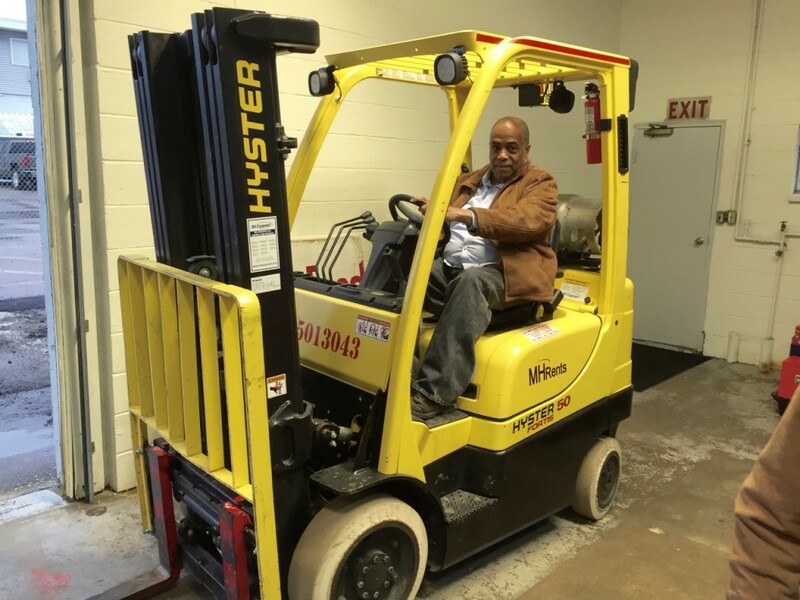 Another example: the program was in need of a new forklift this year. 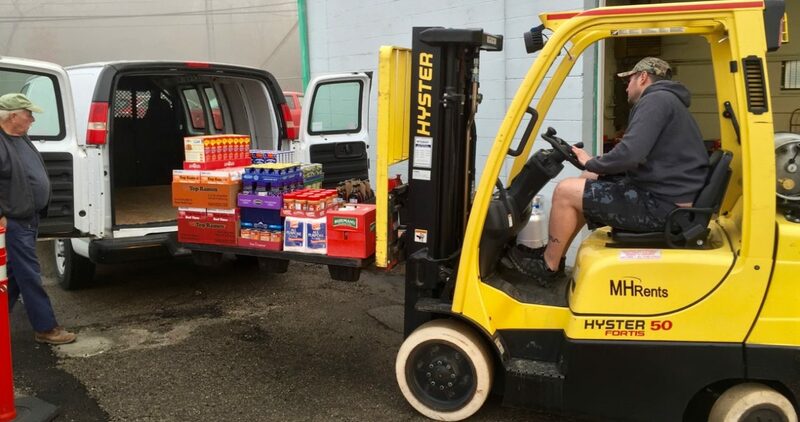 The Cross Lanes location of MH Equipment came through big-time by donating the use of a fine Hyster forklift for the food distribution season. On Monday through Thursday each week, food is purchased and delivered in bulk to the warehouse floor. 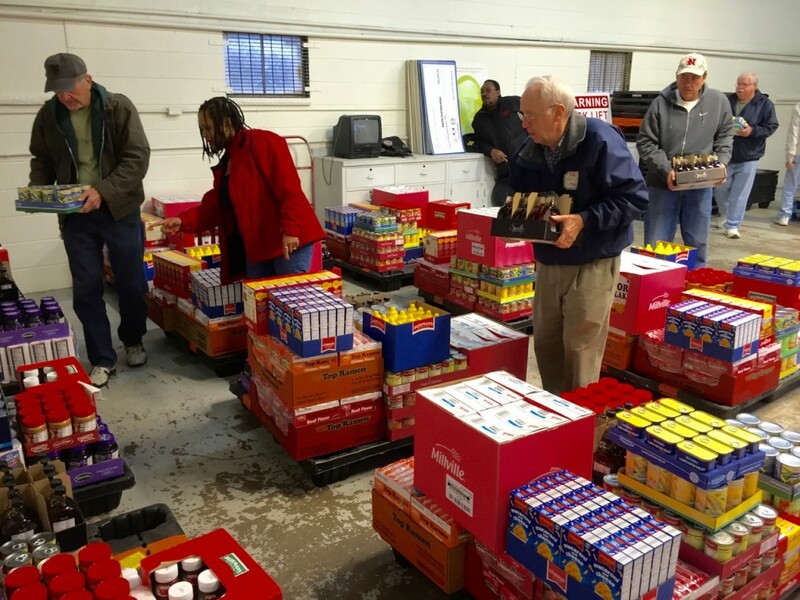 On Friday mornings, volunteers sort the food and divide it into parcels for each participating food pantry. A different community organization recruits and brings the workers needed to help sort the food on Fridays. 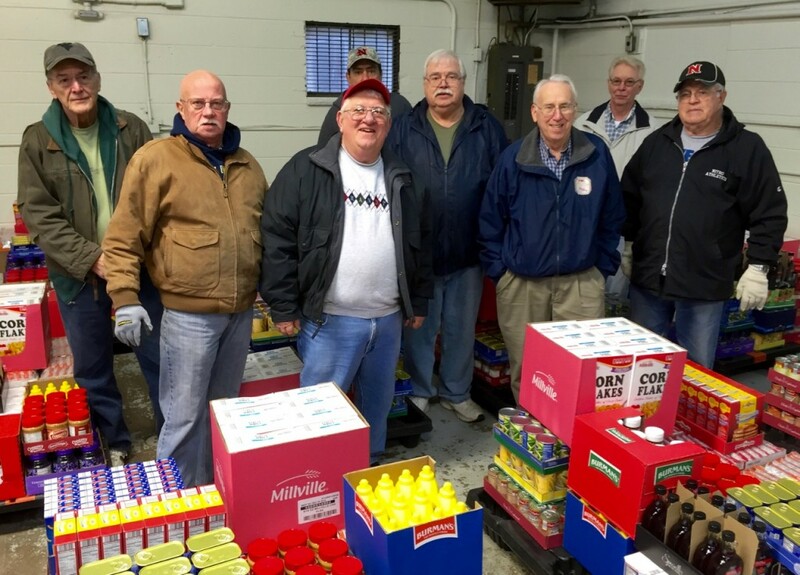 This week it was volunteers from the Nitro Food Pantry. 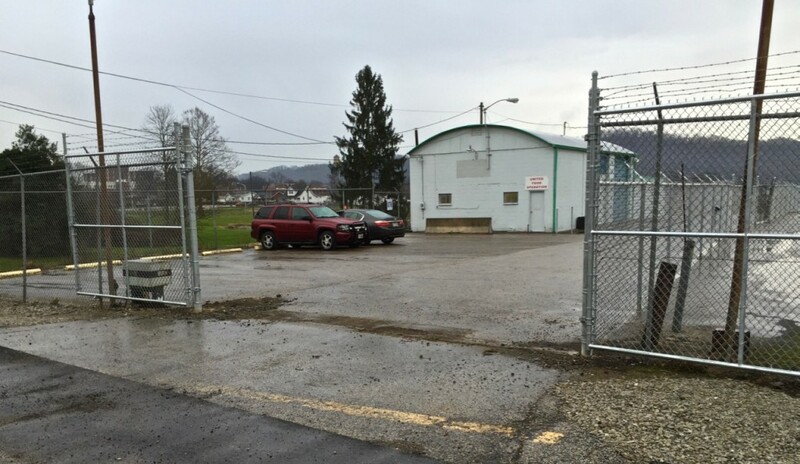 United Food Operation’s distribution center now has easy access off Rt 25 with its own fenced lot.